Touring through India in a week in a train, so regally Indian, can be the most memorable of your touring memories ever. The Palace On Wheels, one of the Indian Railways imperial gift to the tourism industry, is a luxury train that begins in Delhi and serpents its way through the pages of history stopping by the reminiscing destinations. 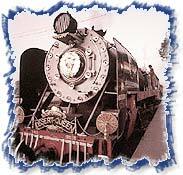 What makes the whole cruise singularly spectacular is the ambience the train posits, a fusion of antique royality and modern amenities - something that can be best called 'a life king-sized'. » Truly imperial - is what the Palace On Wheels is - with its exquisite array of elegantly furnished cabins, well stocked bar, sumptuous Indian delicacies served in its two dining cars, replete with traditional royal treatment of its guests. You can pass your time admiring its majesty in one of its comfortable lounges with tranquil music on, or take up a book of your choice from its library. You can also make ISD calls in case the touring experience seems too much to contain. A quick peek at the facilities will help.... ..
» Exquisite Rooms - There is a choice of 14 AC deluxe rooms, lavishly embellished with carpeted floor and walls, intricately designed furniture with traditional motifs, intercom, attached toilets, hot and cold water. .
» Royal Coaches - Fourteen majestic coaches, each named after former Rajput States, conjoin to form the regal train. Each saloon has a mini pantry and a dainty lounge to ensure availability of refreshments, no matter what time. » Feast Your Taste Buds - The train has two delectable restaurants "The Maharaja" and "The Maharani" bathed in Rajasthani ambience and serving scrumptious Continental, Chinese, Indian and Rajasthani cuisines. » Spirits For The Spirited - The train's bar is a store-house of choicest of sprits of Indian and international origins. Day 02 : JAIPUR : Arrival 03.00 hrs. Departure 19.30 hrs. Day 03 : SAWAI MODHOPUR : Arrival 04.00 hrs. Departure 10.30 hrs. After lunch on board you are in Chittaurgarh. Images of love and valor; scars of battles lost and won...thrice-besieged, Chittaurgarh Fort is all this and more. Moving legends of honor and pride will echo in your mind as you proceed to Udaipur. Day 04 : UDAIPUR : Arrival 07:30 hrs. Departure 17.30 hrs. Day 05 : JAISALMER : IArrival 09.00 hrs. Departure 23.45 hrs. In the heart of the Thar desert lies Jaisalmer, founded by Rawal Jaisal, in 1156 A.D. Here the yellow sandstone fort is an imposing sight, towering magnificently over the city. Discover the painstakingly latticed havelis or mansions with their grand facades. 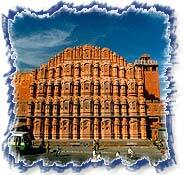 The Nathmalji-ki-haveli, Patwon-ki-haveli and Salim Singh-ki-haveli are fine examples of the stone carver's skill. Shop for fine pattu shawls ,mirror work and embroidered articles , wooden boxes , trinkets , silver jewellery and curios. Day 06 : JODHPUR : Arrival 07.00 hrs. Departure 15.30 hrs. Day 07 : BHARATPUR : Arrival 06.30 hrs.Departure 9.00 hrs. Day 07 : AGRA : Arrival 12.00 hrs. Departure 21.00 hrs. Upon arrival visit the Agra Fort and after lunch arrive at the Taj Mahal, one of the seven wonders of the world. A pristine monument of undying love, it was built by Emperor Shah Jahan in memory of his beloved queen Mumtaz Mahal. Agra is known for its splendid marble inlay work like the Pietra Dura work on the Taj, leather goods and jewellery. Day 08 : DELHI: Arrival 06.00 hrs.